I’m naturally a pessimist. I sometimes try to write in an uplifting way as if to encourage the troops. The moral, after all, is to the physical as three to one. But it’s generally me who needs encouraging most of all. I fully expected the SNP to gain a majority in the Scottish parliament. I didn’t even consider that the Conservatives could possibly come second. I was sure that in last year’s general election there would be a hung parliament and that the SNP would have a place in a Labour cabinet. Let’s just say then that my ability to predict is dismal. But then which of us knows what is going to happen next week, let alone next year? How many of the surprising events of the last five years did you guess? We can’t even predict the weather with any accuracy. The best weather forecast is and will always be the act of looking out of the window. So if you are one of those who still remain optimistic about a win for Brexit in June, feel free to discount my prediction. Of course anything is possible. But my guess is that unless something very odd happens the UK will vote to remain. I also think that it won’t matter. In William Cowper’s poem Boadicea: An Ode he imagines the British warrior queen on the verge of defeat to the Roman legions. A druid, who has a better ability to predict the future than I do, tells her that defeat at the Battle of Watling Street will in time become a victory. Somehow he can see what Britain is destined to become and so in the long run dominance by the Roman Empire is merely a temporary setback. Can it be accidental that the founding document of the European Union is the Treaty of Rome? The first Roman Empire was run by the Caesars. The second was described as neither Holy nor Roman nor an Empire, but still managed to rule central Europe from 800 to 1806. The third Roman Empire began in 1957. It will fall much quicker than either of the first two, no matter what we in Britain decide. The third attempt to establish Pax Romani in Europe is not bringing Europeans closer together. It is creating division and hatred. Far from preventing war, the European Union by its meddling created conflict in Ukraine where previously there had been peace. The European Union ought to have realised that Russia like every country has strategic red lines. The idea that Russia would allow the cradle of Russian civilization and a place where huge numbers of Russian speakers still live to join a hostile bloc is naïve. Whatever the rights and wrongs of the situation, Russia was always bound to respond. The European Union is likewise in part responsible for the breakup of Yugoslavia and the fact that this country dissolved itself by means of war and genocide. It was once more, the promise of joining the European Union that encouraged secessionists in Yugoslavia. It was the fact that the European Union thought that it could manage the conflict which led to it escalating so horribly. Above all it was the attempt to extend the borders of the European Union right up to Russia that has created the New Cold War that we are experiencing today. The fall of communism need not have been accomplished bloodlessly. This happened only because the Soviet Union chose not to fight it. A few machine gun bullets would have stopped the fall of the Berlin Wall in five minutes flat. It took something of a miracle for communism not to end in war. But that miracle only happened because the West promised the Soviet Union that we would not try to take over the Warsaw Pact and would not destroy the strategic buffer zone Russia bought with so many lives in World War Two. The EU broke that promise and is itself the source of a potential conflict with Russia. Either it should have allowed Russia to join the EU in 1991 or it should have gone no further east than the Oder. Leaving Russia isolated and feeling threatened is no more wise than encircling Germany in the years leading up to World War One. Within the EU we now have a huge gulf between the wealthy North and the poor South. Countries like Greece, Italy and Spain have seen their young people impoverished by unemployment or forced to flee abroad. The European Union’s attempt to create a single currency is directly responsible for a great deal of suffering in these countries. Far from creating European unity, the Euro has only created resentment between those who have debts they cannot pay and those who lent the money and are determined to get it back at any cost. This cannot long continue. Either the Eurozone becomes a single federal nation state with fiscal transfers from the richer parts to the poorer parts or at some point someone is going break free and establish their own currency again. It won’t be Greece. It probably won’t be Italy. But who? The French are very close to rebellion. It is not the French role to be quite so subservient to Germany. History always repeats itself. The Gaul at the gates is not this time called Le Brenn, but rather Le Pen. Perhaps this is why everyone is so keen that the UK doesn’t leave the EU. It might just provide the example that France is looking for. We can already see the seeds of the destruction of the European Union. It may be destroyed by another debt crisis. But if that doesn’t do it, the crisis in the Schengen zone will. Last year Angela Merkel appointed herself Holy Roman Empress and decided to open Europe’s gates to all comers. In this she went contrary to the whole current of European history, which is the struggle to defend Europe’s borders. If there is one thing that has united Europeans for more than a thousand years it is the defence of Christendom. Without that there would be no Europe today, for we would have lost all the battles that kept our rather arbitrary little continent intact. Merkel’s rash and unilateral decision had consequences for everyone. 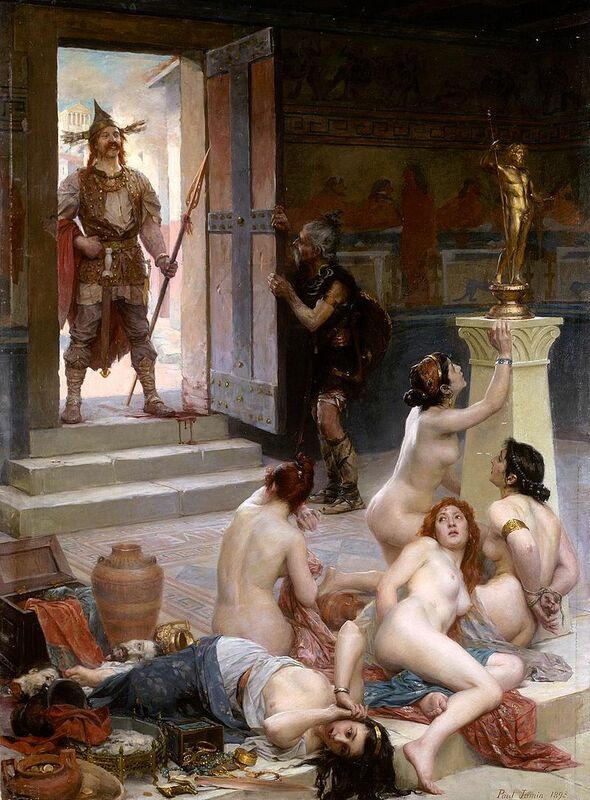 But here there was the first rebellion against Roman rule. The Hungarians built fences. The Poles refused to accept that the demographic makeup of Poland would change. The attempt by the European Union to bring down borders has already failed. They will go up again whenever they are required. With hindsight it was obvious years earlier that communism would fall. But no-one at the time guessed that it would happen quite so soon. There were contradictions in the Soviet Union, but it was far more stable than the European Union is today. The British rebellion may well fail. But it won’t matter. We will have to wait far less than Boadicea did. It may even be that defeat now will in the long run be better for us strategically. We will have a say in how the third Roman Empire collapses and we may be able to help it on its way. There will come a time when those who want the EU Empire to continue will deeply regret that their threats bound us to them. Long term a defeat now is merely tactical. We too can look forward to a time when the third Roman Empire will be no more. It will happen no matter which way we vote. So if there is to be a defeat, let’s not worry about it, let’s get on with our lives knowing that we’ve suffered defeat before only to triumph in the end. There’s something peculiarly British about our celebration of defeat. It’s because we always win in the end. 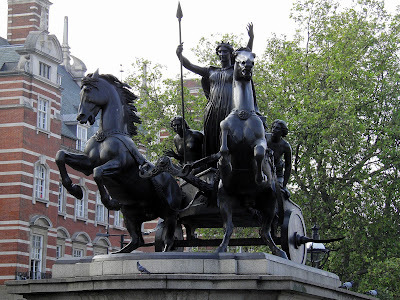 Boadicea knew this, for unlike me she could predict what would happen centuries into the future. Quite soon historians will look back on the third attempt to create a Roman Empire and they will wonder at the sorrow and the pity of it all. Let us only hope that when it dissolves it does so in a measured and orderly way. It is no more possible now than it was at the time of the Caesars to unite people who speak such a variety of languages and who think of themselves as fundamentally different. The contradiction inherent in the project was there from the start and therefore from the moment they signed the Treaty of Rome it was already doomed. The prophecy from two thousand years ago remains just as valid. Rome will perish. It may be this year. It may be next year or we may have to wait a little longer. But be patient. The EU is as undemocratic as the House of Lords. Everyone with power in the EU is appointed rather than elected. But unlike the House of Lords the EU has the power to make terrible mistakes like Schengen and the Euro. We can leave them too it. The third Roman empire will fall by its own folly. Pretty sure its not the EU expansionism up to Russian border that is the issue but the expansion of NATO....UK looking to place tanks in Eastern Europe is not in any way driven by the EU, its wholly a NATO guise. Pretty sure Effie you were one of those championing the loss of NATO membership as being downside of Scottish Independence or am I mistaken ?